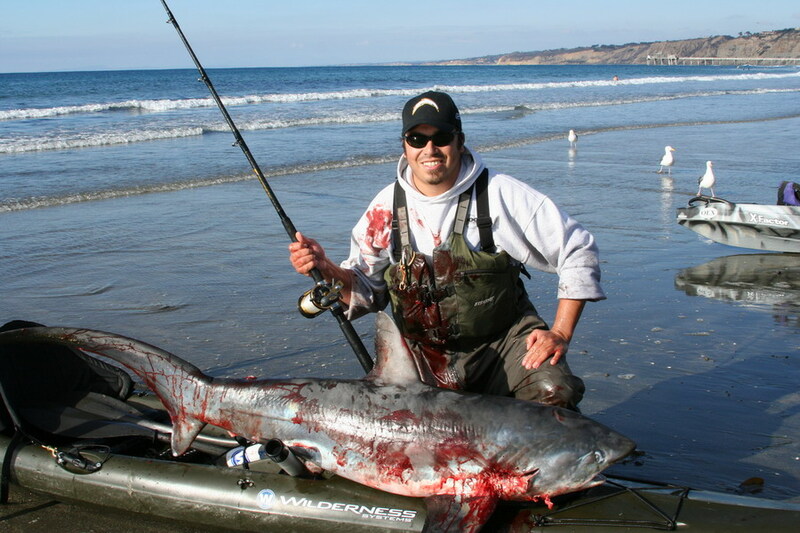 I had wanted a Thresher shark off my kayak for about 3 years now, as I found it something of a big challenge, not to mention excellent table fare. I had never really tried for one, mainly because I didnâ€™t know much about fishing for Threshers, and more importantly landing them. 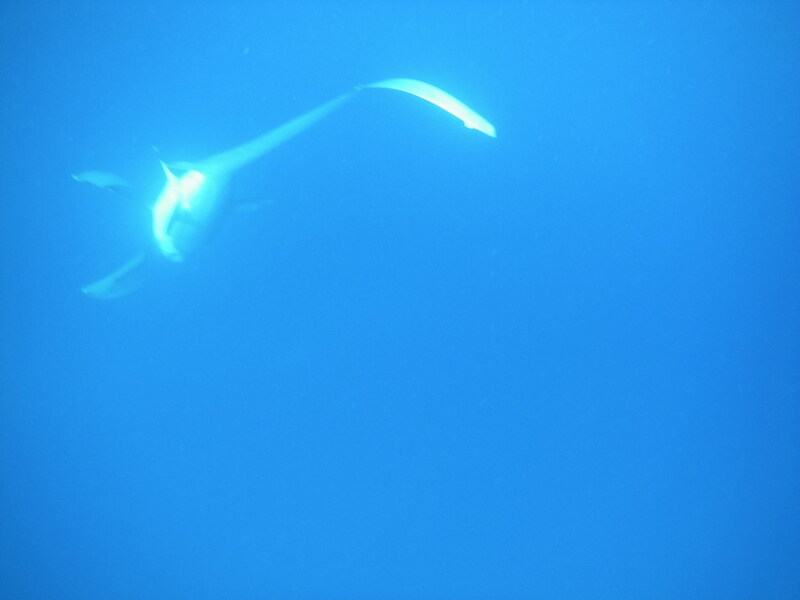 One thing I learned from Tomâ€™s shark was that it is good to have support with you, because after seeing what may have gone wrong, it made me realize that I would not want to do this on my own. A few weeks after Tom caught his thresher, I had seen fishing reports, some less visible than others, but nonetheless a paucity of thresher still continued to bite. I had even gone out the next week from Tomâ€™s catch alone on my Tandem with a big Rapala on a stand up rod with 4/0 Penn reel spooled with #80 mono to no avail. Below a picture of my tandem, with a noose, a buoy, and of course, a jig stick, just in case. 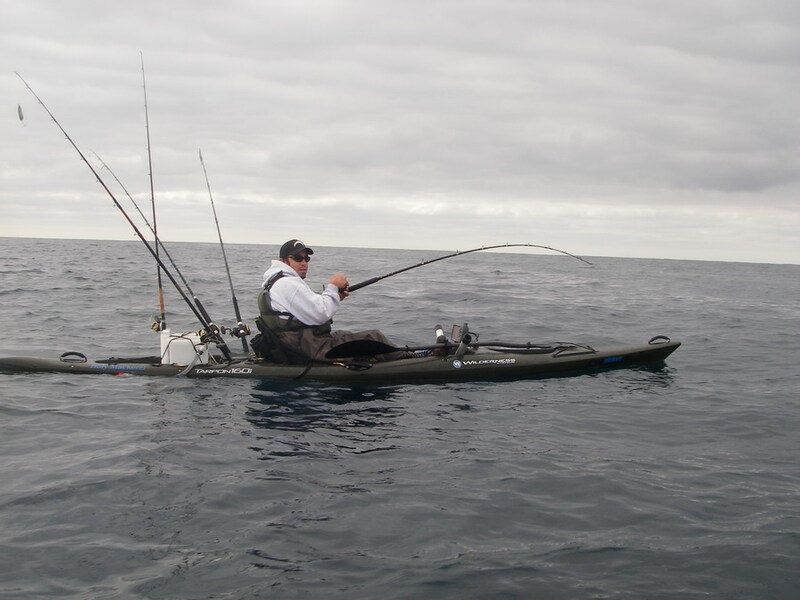 But this day, I had continued my search on my faster kayak for another yellowtail working the yoyo in the usual â€œspots,â€� as they have become known for other anglers who have hooked up on certain GPS marks, shared amongst a close network of friends. I was chucking the Iron, for me a boring way to fish, but highly effective for homeguard winter yellowtail. I was also soaking a live pacific mackerel on a 2/0 hook on a 4oz of lead on a slider, hey you never know, might as well have bait out while you YOYO. It was a seemingly slow grey morning, with spots of sunshine, and as far as the action was concerned, a couple of â€œrun and gunâ€� on bait fish being pushed up, with no results. I decided I would stop and work my Iron while I paddled in just off Punta La Jolla. I had fished near, and around Brad Messmer, and Pat Holmes, whom also reported slow morning with spots of bait. Just as I started thinking â€œI wonder what happened to those threshersâ€� no really I did think thatâ€¦ my bait, which was partially in gear, gets smoked!! ZZZZZZZZZZZZZZZZZZZZZZZZZZZZZZ!!!!!!!!!! 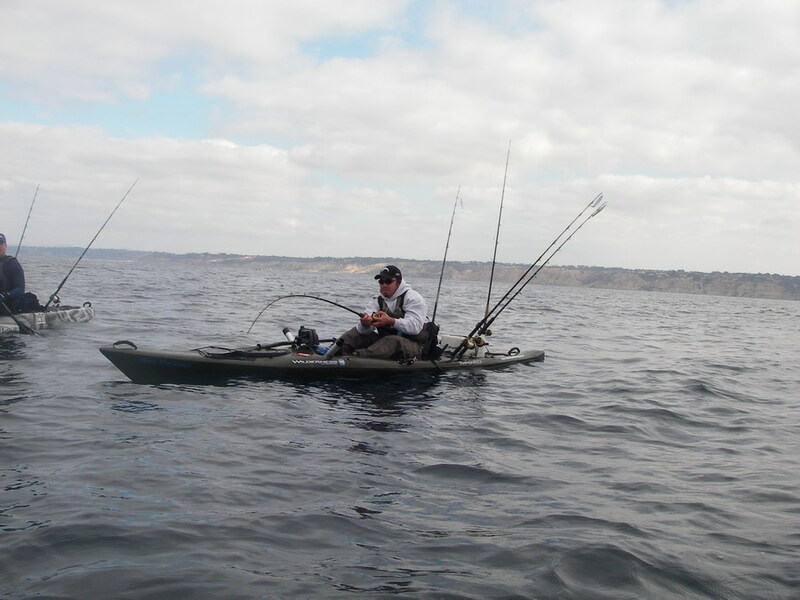 !Â I pick up my rod point is at my bow, which turns me, and fish on!Â It felt like the right kind, fast strong runs straight down, bouncing rod tip, I was stoked.Â Brad and Pat who were still nearby heard the roar of my clicker, paddled up to join me. I felt like I was gaining most of my spectra back, and even to the point, where I got my gaff ready.Â But then a longer run, which was no longer vertical, and according to my GPS, we were traveling about 2 knots into the wind.Â We determined at this point, I had hooked into a thresher shark. This fish made strong runs, and to rest, I used my wading boot to hold up my rod tip, like one would use a rail on a boat. I seemed to gain line back, but the fish would take striking runs, only to burn all the line I would gain, then just dog down. I was running #65 spectra to a #40 Seaguar fluoro leader, incidentally, a set up which I hadnâ€™t changed in a while, and had been on that rod for weeks. In fact there was noticeable rust on the hook, and for storage I wrapped the leader around my reel handle, causing a visible kink in the line. This kink in the line, along with my â€œsuspectâ€� knots would haunt me the entire fight. Two hours had passed, and we were towed to nearly the same area as Tomâ€™s fish weeks earlier, 200ft of water, three miles off the point, only to see Pt. Loma, and to some extent downtown San Diego. I fought this fish with no color at all for about 2 hours, when we got our first glimpse of this fish, to which Pat who had the best look, estimated over 100 lbs. Once more the fish took one Violent run, my Daiwa Sealine reel had already been buttoned down to the maximum, short of breaking my fluoro leader. I was fatigued at this point, but had entered a fight, and like my hockey days, I wasnâ€™t gonna lose, so I put more pressure on this fish, as it appeared to just dog me on the bottom, in fact, none of us, could read it on our sonarâ€™s. I started to short pump it up, only to gain 5 inches at time, then lose 3 inches, with the now present nagging onshore wind pushing me further from where my fish seemed to dog me. Brad reminded me to not thumb my spool, a bad habit, I find hard to break. We began to assess the situation, and came to the conclusion that perhaps this fish had drowned, or was severely fatigued. the noose. With the help of Brad grabbing its long tail, I grabbed its pectoral fin, stuck a flying gaff in its head, and heaved it on my kayak. We were stoked, and astonished to find that my knots and leader held against the weight of the shark dragging on the sand and against the wind. 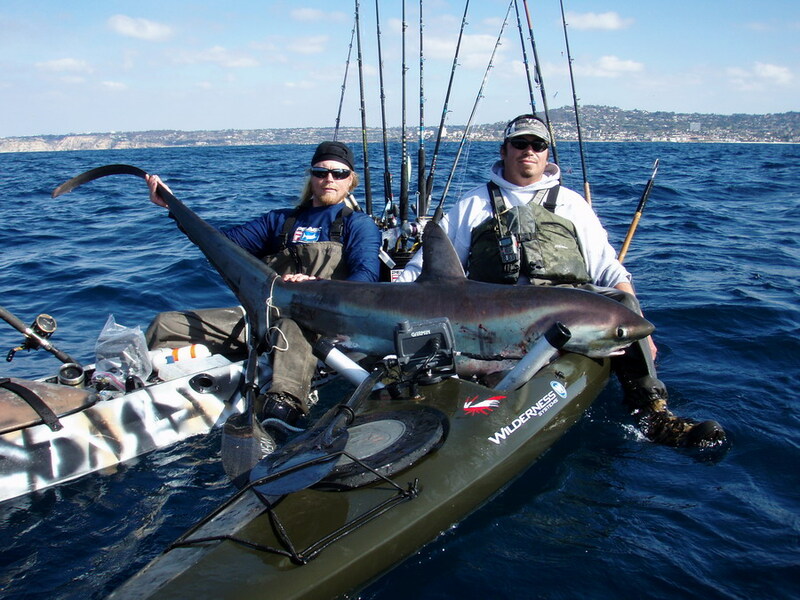 I was glad to have Pat, and Brad there to help me, because with all my gear, and the shark, my kayak was pushed to the limits. 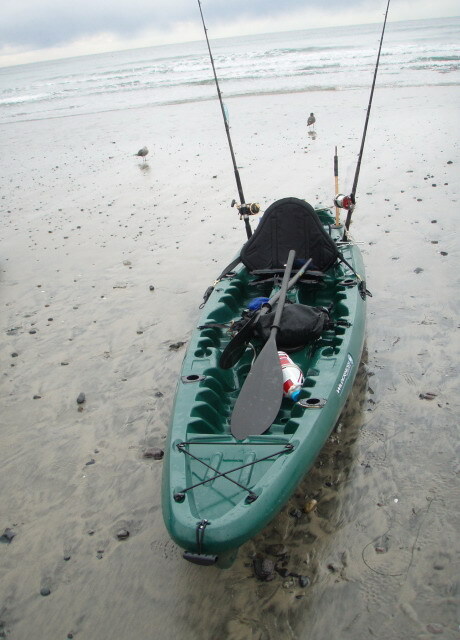 Pat generously offered to paddle in my fish on his Malibu Xfactor, which has a higher payload. On the way in, we saw three grey whales about 75 yards away come up and loudly spray at least 10ft in the air, and we agreed how lucky we were to have this fishery. The onshore wind swiftly pushed us into the launch at the end of Avenida de la playa, where we landed with minimal surf. 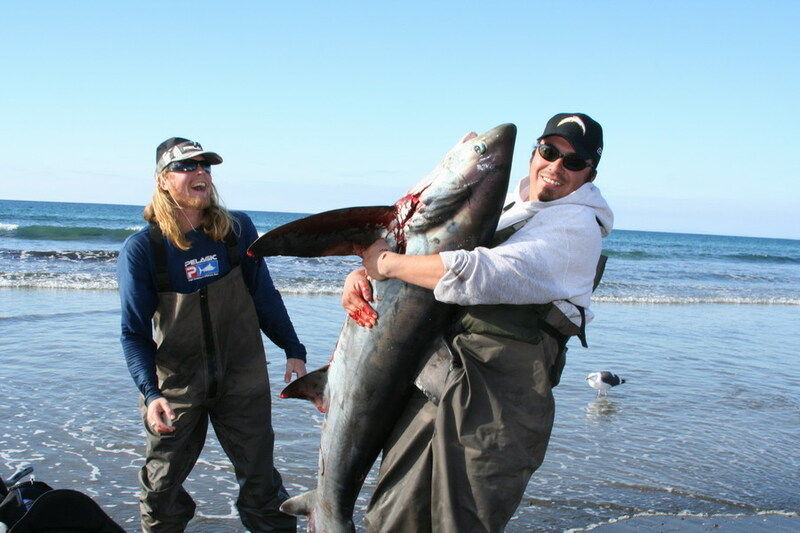 A crowd had gathered on the beach around the Thresher shark, the same as a couple weeks prior. 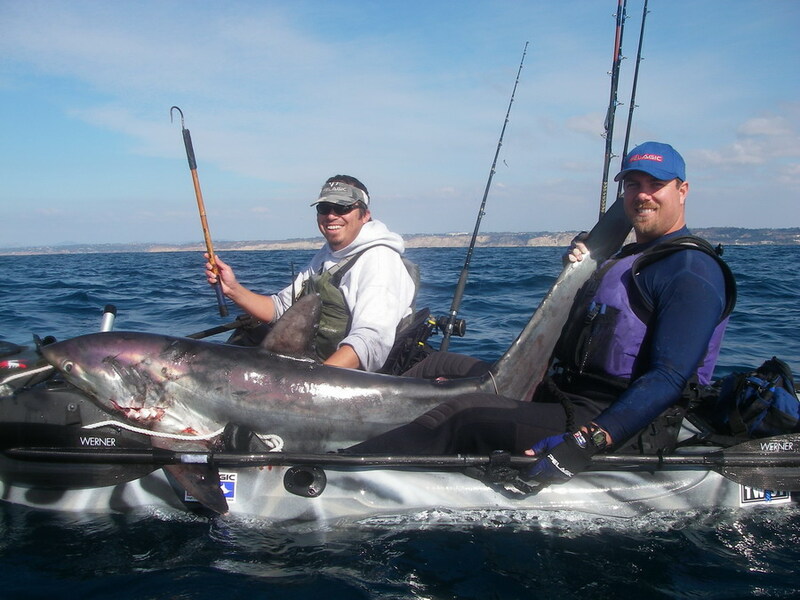 I had to field questions from tourists, who otherwise may not have understood my answers to the technicalities of landing such a fish, but they were happy to see such a feat on a kayak and snap pictures. Chris Fierro is a member of the Wilderness Systems Pro-Staff and is a contributing member of Big Water's Edge.